In 1970s Jerusalem, watermelon stalls appeared along the city’s seam line, transforming this no-man’s-land into a band of twinkling lights where residents and visitors of all cultural, religious or political backgrounds were welcome. While the stalls are long gone, the sweetness of the watermelons and what they represented still lingers. 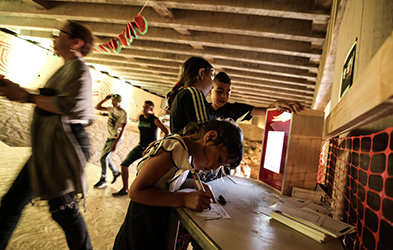 This space of encounter among different cultures, peoples, languages, smells, and flavors, which is so deeply characteristic of Jerusalem, will be reenacted by the project “Meeting Point,” which will take place under the bridge between the Katamonim, Pat, and Beit Safafa neighborhoods. The ephemeral structure enacted on this site will constitute an artwork in its own right, and will feature a performance stage, numerous activities, and a watermelon stall worthy of the city’s tradition (Muslala 2015). The Hybrid Meeting Point is an interactive installation that consists of an open and exclusively local WIFI network, a projection and the Hybrid Letterbox. It was created for and shown as part of the “Meeting Point”, an initiative carried out by Jerusalem‘s Muslala Artists Collective and as part of the Israel Festival 2015. 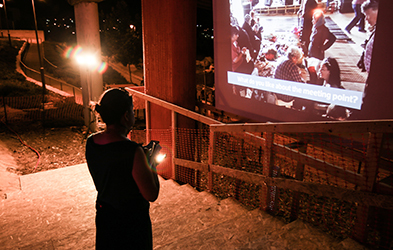 This installation allowed anybody who visited the meeting point to create and share content and to interact with one another. The installation was realized in English, Hebrew and Arabic language. 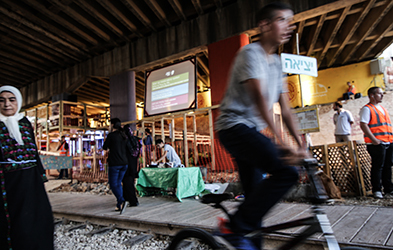 The local, or “offline” network (Antoniadis, Apostol, Unteidig, Joost 2014) is confined to the physical space around the bridge – only visitors that are present can contribute or access the content created. Anybody can access the Hybrid Meeting Point either through their personal devices like smartphones, tablets or laptops, or through the Hybrid Letterbox. Depending on the day’s program, the Hybrid Meeting Point has different topics, questions and information around which visitors interacted with each other. This collectively created content was shown in a responsive projection. Over time, a dynamic collage of handwritten as well as typed messages in three different languages, drawings and photographs emerged and functioned as a mirror of the encounters, interactions and experiences shared by the visitors of the Meeting Point. In collaboration with Lutz Reiter. The Hybrid Meeting Point was realized within the bilateral Project “Community Now?”, funded by the German-Israeli Future Forum Foundation (DIZF).